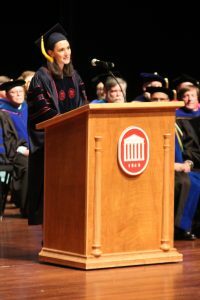 Harris received her bachelor’s degree from the University of Mississippi. She enrolled in the terminal Ph.D. program at the university to work under Kenneth Sufka, professor of psychology and pharmacology, and was awarded a master’s degree along with her Ph.D. In her research, Harris looked at the effects of a cannabidiol analog in combination with ineffective doses of opioids to see if they produce synergistic effects. “Essentially you’re just taking two drugs that are ineffective and putting them together, you’re getting this really high analgesic response, yet there is no rewarding value … like morphine without any abuse liability,” she said. Harris said she feels lucky to have worked in professor Sufka’s lab and to have the opportunity to work with many undergraduate students. Harris hopes to obtain a postdoctoral position researching novel analgesics that are void of abuse potential.